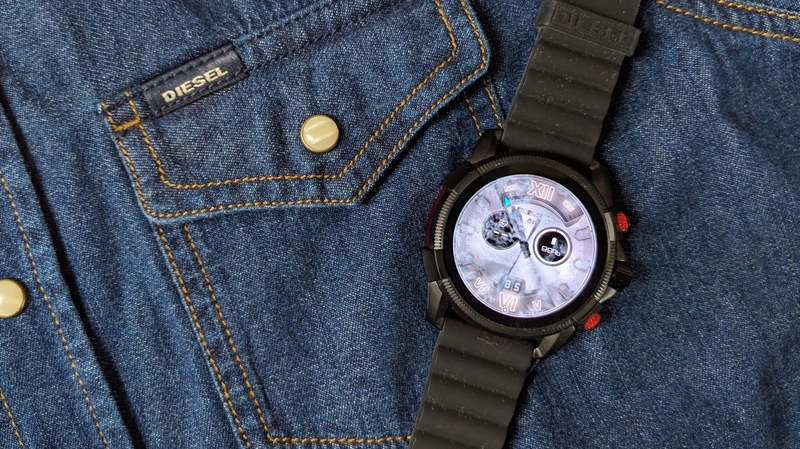 The Diesel On Full Guard 2.5 joins the growing collection of stylish smartwatches running Google's Wear OS. As the fashion-focused Wear watch falls under the Fossil Group umbrella, it's getting the same treatment as all of the company's other fourth-gen smartwatches. That means contactless payments, built-in GPS, a heart rate monitor and waterproofing so you have fewer reasons to take it off. That's all wrapped up in a design that will instantly feel very familiar to Diesel watch fans. The On Full Guard 2.5 comes in at $325, stepping up to $350 for the stainless steel version. That makes it cheaper than an Apple Watch Series 4 or Samsung Galaxy Watch, but it's more than it'll cost to pick up a Fitbit Versa. In our review of the first Diesel On Full Guard, we were let down by its heavy design, half-baked software extras and poor battery life. With the addition of new features and slimmer look, does the Diesel Wear do a better job of it second time round? We've been living with the On Full Guard 2.5 to find out. Here's our full verdict. If you're a Diesel watch fan, you're going to be pretty satisfied with what you get from the Full Guard 2.5 in the looks department. This is every bit inspired by traditional Diesel watches with that industrial style, machine metal body and thick interchangeable strap. This is a smartwatch that wouldn't look out of place among Diesel's trove of dumb watches. There are four models in total, giving you your pick of silicone or a brown leather strap with a pricier model offering a full stainless steel look. Bottom line, these are smartwatches built for manly wrists. There's a hulking 47mm watch case and a 13mm thick body. While we had some complaints about the size and the weight of the first Full Guard, it carries that size much better in its second iteration. While it's the same diameter, 1mm has been shaved off the thickness, which doesn't sound like a lot, but considering how many new features have been added, it's quite impressive. Some elements have been carried over to the new watch. So you've got the two twisting, physical customisable buttons, which sandwich a rotating crown to offer an alternative way to navigate screens on the watch. We don't like relying entirely on a touchscreen – sometimes a button is just easier – so we're glad they're back. Speaking of that touchscreen, it has dropped down in size from 1.4 inches to 1.39 inches. Yeah, not a lot, and it doesn't a make great deal of difference using it. It's still a lovely, bright, vibrant AMOLED screen that pleasantly showcases Wear OS and Diesel's software extras. We should of course mention that this watch is now fit for the water. Like the Skagen Falster 2 and the Fossil Explorist HR and Venture HR watches, you can go swimming with the Full Guard 2.5. It will also track your swimming in the pool with the appropriate third-party app. Would you want to go swimming with this watch? While the silicone strap certainly makes it a better fit for the water, it's not a watch we'd say is the most comfortable to wear in the pool. It's nice to not have to worry about getting it wet though. Like it predecessor, the Full Guard 2.5 runs on Google's Wear OS. That gives you the full gamut of Wear OS features including notification support, customisable watch faces, the ability to download Wear apps directly from the watch and also make use of Google Assistant. If you've used a Wear OS smartwatch before then it will all feel very familiar. Google has gradually polished the Wear OS interface, while its Google Fit software has been given a much-needed revamp. Notifications are just a swipe away and it's quicker and easier to get to key watch settings like screen brightness, or turning on that Do Not Disturb mode. It's fair to say that Wear OS is still not as polished as rival platforms from Apple, Samsung and Fitbit, though. Core features like notifications and music controls work fine, but it doesn't feel as tightly knit as those other platforms. It's not all about Google's software here though: Diesel tries to make this feel like a Diesel smartwatch, and not just a shell for Google's Wear OS to live inside. Diesel has included its own bunch of unique watch faces – some of the most inventive we've seen. They're busy, but very Diesel. There's also an app called Dial Effects that lets you display secondary data (activity and weather) in a subtle way. Then there's Diesel T-On-I, an app that gives you a stylised look at your day, including step counts and weather. There's nothing really new here, but they're playful additions that allow Diesel to put its stamp on the smartwatch. While we don't have many complaints about the software, there are definitely some question marks over the performance. The watch is powered by Qualcomm's Snapdragon 2100 processor, not the newer 3100 processor. We don't know whether it's do with the demands of the latest version of Wear OS, but we found the experience very laggy at times. Changing watch faces, for instance, proved frustratingly slow and buggy. Hopefully it's just a software fix away from resolution, but it did make the experience a frustrating one at times. Aside from the added waterproofing, the big new features on the On Full Guard 2.5 are Google Pay, a heart rate monitor and built-in GPS. Google Pay in particular is one we've been arguing for on more Wear OS watches. It was missing from the first Full Guard, so it's nice not only to see it here, but also to see that it works and adding the tech that makes it possible hasn't impacted on the design. As far as the new fitness features are concerned, it's obviously nice to see them here, but we'd question whether they're really needed – especially considering our experience with them. It's a similar story to the other latest Fossil watches: for casual fitness fans, they're fine, but you wouldn't want to rely on them if you were training for a marathon. GPS accuracy seems to be up to the task for shorter distances (5km), while heart rate monitoring particularly for exercise was generally higher than the heart rate monitor chest strap we put it up against. This is not going to replace a dedicated sports watch. There are third-party apps you can send your data to, but if you're relying on Google Fit then you might find the experience a little underwhelming. It's perfectly fine for basic fitness tracking, but as soon as you step things up, it becomes less reliable. The big news on the battery front is that you're now getting a 300mAh capacity battery, which should deliver a maximum of two days. That's dropped from the bigger 370mAh battery included in the first Full Guard smartwatch which could net just a day of watch time, if that. We know 1-2 days is pretty much the norm for Wear smartwatches, but the On Full Guard 2.5 seemed to run out of juice faster than other watches we've lived with. Two days of battery seems like wishful thinking, even when you're restricting use of power-sapping features like heart rate or turning the screen brightness down. A day and a half is achievable, but you're really playing with about a day here. The Diesel On Full Guard 2.5 is arguably one of the best looking smartwatches out there. Whether you like Diesel watches or not. The new features are welcome if not all that necessary in our eyes. We'd have taken Google Pay and some more interesting software extras as this doesn't feel like a watch to hit the gym with. The bad news is that the software seems a little buggy and maybe it's a little underpowered to keep Wear running smoothly. If you want a stylish watch that can muster up a good performance, you might actually be better suited going for one of Fossil's own watches or something like the Skagen Falster 2 instead. I actually like the size, the black version look particularly badass. Kudos for the 3 atm waterproofing. Still not competitive with my Mission, but getting closer. What does 3 atm mean in the real world, though? Can the buttons be operated under water? Which is kind of a requirement, since the touchscreens are still useless in water and they are mostly just a potential source of interfering signals. My stopwatch and timer on the Mission are often triggering a start or stop when they shouldn't because of the water doing something to the screen when I am practicing. Also, I'll wait for the new Qualcomm chips to be integrated into the watch, maybe bump it up to 5 atm, and will keep close watch on the battery life. Oh, and LTE would be appreciated, but I think that's what the new Qualcomm silicone brings to the party. But definitely, this and the Skagen Falster are watches to keep an eye on. I just wish Nixon did something to the Mission. They pretty much nailed it with V1, just a few improvements (the charging terminals and the reliability of the charging sure could do with some improvement), LTE and NFC, and maybe some battery life, and they could keep their position on the top of the pile. I'm with you on this. The Mission has been my all time favorite wear watch. The only issue i've had is the charging terminals. I feel like induction charging should be a requirement for all smart watches at this point. Over all the diesel on full guard 2.5 watch har everything I was looking for in a smart watch so I thought. I perched it at best buy with in half hour of using it I was so disappointed. Of all the features they left out the internal speaker which was a deal-breaker for me return mine immediately. I also own a Huawei watch 2 classic witch has all the bells and whistles. The only think for me is the size of the screen or I wouldn't give it up for anything.